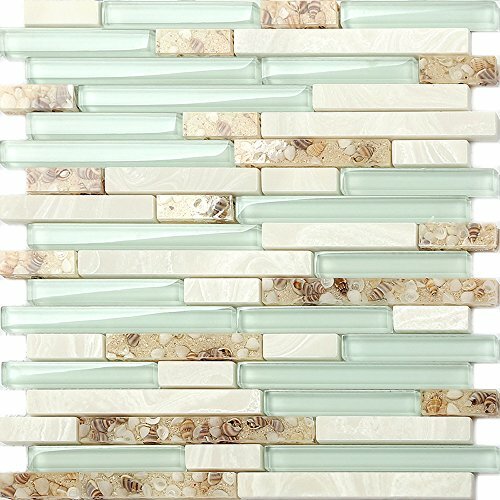 This stone glass tile has a name "Peaceful Beach Holiday". It is interlocking design. The light green crystal glass chips stand for the sea, the super white stone chips sand for the waves, and the sandy acrylic chips stand for the beach. These harmonious colors weave a peaceful beach holiday dream for us. The acrylic chips have real small conchs shells and sand in them. Bring nature to your home! Each of the tile is in 12''x12''. We have two options for customers. One option is 11 sheets per box (covering 11 sq.feet). Another is 5 sheets per box ( covering 5 sq. feet). We do offer samples. And we suggest customers to order a sample before full size orders. We have our warehouses both in California and Kentucky. We use UPS ground service to ship tiles which takes 2-6 business days for delivery. We hope all customers enjoy the shopping experience on amazon and love our tiles! Listing Price is for 1 Box Including 5 sheets, Free Shipping. Mesh Backing, Non-sanded Grout for Installation. Professional Packaging. Free Replacement for Damages Caused by Shipping. If you have any questions about this product by TST MOSAIC TILES, contact us by completing and submitting the form below. If you are looking for a specif part number, please include it with your message.